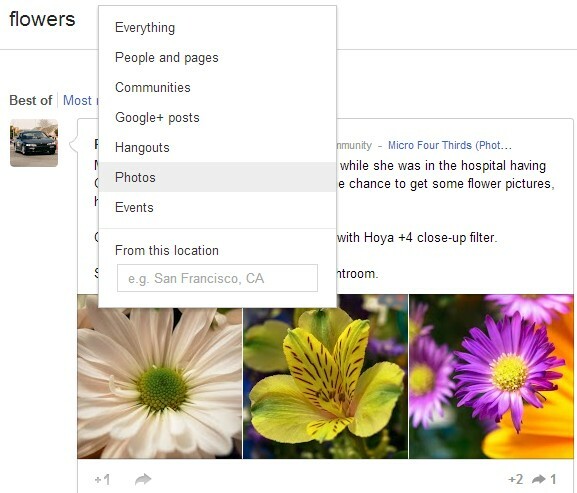 If you want to restrict Google+ search results to posts that include photos, you can now do that. After performing a search, click the "Everything" dropdown and select "Photos". "You can find any photo post (...) from items shared only with you, to public photos shared by some of the great photographers on Google+. Here are some searches that I enjoy: [Long exposure], [Steel wool], [Cartoons]," says Google's Dave Cohen. Unfortunately, Google shows a long list of posts instead of a grid of photos. It's worth pointing out that the search results don't include photos uploaded to Google+ that haven't been explicitly shared. So what the heck's happening with Google? I don't recall ever seeing a typo on Google search, but today there are dozens, hundreds! The kind of errors that text-reading computors make. Like 'than' for 'that' -- stuff like that. Your recent comments make me feel like I'm eating at a table with three legs, and this new error-strewn status seems part of the picture. In-spite of regular user of Google Plus i was unaware about this feature that we can filter our searches in Goolge Plus as well. It is nice way to search more specifically and effectively about the things we want to search.